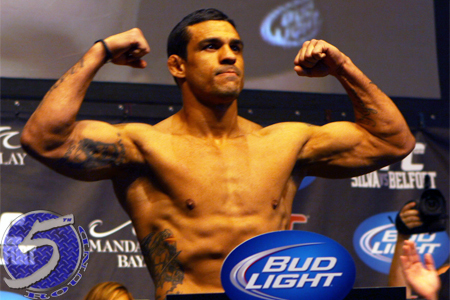 Although nobody is saying a thing about the results of the random drug test the Nevada State Athletic Commission sprung on Vitor Belfort (pictured) at the MMA Awards on February 7, suspicious minds like mine are starting to believe the urinalysis didn’t come back clean. Belfort, who has become the poster child for testosterone replacement therapy (TRT), was slated to challenge UFC middleweight champ Chris Weidman at UFC 173 in Las Vegas. However, he was abruptly pulled from the May 24 show shortly after the NSAC voted unanimously in February to ban TRT. Because Belfort had yet to file for a license with the NSAC when they surprised him with the pop quiz, the results of his test were only released to the commission, UFC and Belfort. It’s been radio silence from all parties. Belfort could easily kill all the speculation by stating the results were negative – that is, of course, they were in fact negative. Which brings us to present day. Belfort still has not filed for a license with the NSAC. However, the 37-year-old recently told MMAFighting that he is clean and ready to go. “The Phenom” claims to have passed all the tests required by the commission, only he did them “on my own” – as in, with an unofficial home drug testing kit you can pick up at your local CVS Pharmacy. For the most part, the UFC had Belfort’s back when he was powered by TRT and posting highlight reel finishes. Since TRT’s banishment, they seem to have distanced themselves from the Brazilian and left him to figure things out on his own. “No, TRT stuff with the commission,” UFC president Dana White said Saturday of what’s keeping Belfort from fighting. “He’s got to solve his problem with the Nevada State Athletic Commission. And when he does that, we can figure it out. He’s got a lot of work to do. That s*** doesn’t just happen like that (snapping his fingers) – you’ve got to get on the agenda, he’s got a lot of work to do. Dan Henderson, who is a longtime user of TRT and went down as the last man to use the controversial treatment in the UFC when he beat Mauricio “Shogun” Rua in March, will face Daniel Cormier next month in Las Vegas – the same card Belfort was initially scheduled to perform in. So, why is Hendo able to get licensed in Nevada just one month after being on TRT for a fight and Belfort still hasn’t even applied for one? Did Belfort flunk that random screening and will now have his application denied for, let’s say nine months (similar to Alistair Overeem’s punishment when he failed his random test by the NSAC for elevated levels of testosterone)? Is the NSAC simply throwing up more roadblocks for Belfort because he tested positive for elevated levels of testosterone in their state nearly eight years ago? There are plenty of questions, but very little answers at this point. What’s for certain is Weidman will defend his throne against Lyoto Machida at UFC 175 – in Las Vegas, for good measure – and Belfort will be on the outside looking in.